A number of activities related to the Calmed programme have taken place at the beginning of 2017, here is a summary for the major visits / events. Himansu Basu attended the All India Congress of Obstetrics and Gynaecology (AICOG) in Ahmedabad, India (over 11 thousand registrants) and participated in a panel on Maternal Mortality Reduction, sharing details of the Calmed programme. It was a privilege to share platform with many distinguished speakers including Sir Arul ( Past President of FIGO, BMA and RCOG) and Prof Dileep Mavalankar ( Director of Indian Institute of Public Health) – they are supportive of the Calmed programme which received good exposure. Dr Basu met with Gujarat Government Officials Chief Secretary Dr. Jagadip Singh and NHM Director Dr Prakash Vaghale, discussing the last 3 years’ Calmed programme in Gujarat and the way forward there. Visiting the Indian Institute of Public Health, he was welcomed by Director Prof Dileep Mavalankar. Discussions centred on the Institute’s role which included maternal and child health care improvements, including substantial elements of community Obstetrics and Community Gynaecology. It was agreed that discussions should look at education and research at the Academy level, possibly linking clinical care with a Medical College. Opportunities for collaboration with Obstetrical Societies ( SOGOG) and Ahmedabad Obstetric and Gynaecologic Society ( AOGYS) and Medical Associations should be explored. The 3rd Calmed visit to Bjuj took place on 31st January, with a VTT consisting of Rtn. Drs. Upendra Vasavada( from Gujarat) ,Dr. Ishita Mishra ( from Mumbai) and myself. We supervised 9 Master Trainers (including Dr. Prasanta Kumar Deka, Assistant Professor at the GAIMS). 9 (previously ‘Calmed’ trained) local Master trainers trained 28 trainees (Medical officers, ANM and GNM) and 12 ASHA trainers, at the Gujarat Adani Institute of Medical Sciences (GAIMS). Pre and post test scores of knowledge and skills showed highly significant improvement. There was good feedback from the trainers and trainees about the high quality of the training methods, and their positive impact in their practice. Dr Basu followed up Rotary contacts in Odisha regarding the urgent needs for maternal, and of the great strides already being made by the Government. He visit was arranged to health in Odisha and discuss possible implementation of the Calmed model with adaptation suited to the local circumstances. Dr Basu visited Odisha to gain first-hand knowledge of the status of maternal mortality reduction strategies in the state. With local Rotary leaders DG Brig Narayan Nayak, PDG Dhirendra Padhi , and Dr. Santosh Mishra, he met Odisha Government Officials including Principal Secretary Dr. Pramod Kumar Meherda ,IAS and NHM Mission Director Ms. Shalini Pandit to exchange information on the Government strategy and the Calmed programme. Dr Basu explained the high quality Calmed strategic programme, based on the principle of countering medical, public health and societal/cultural issues associated with maternal mortality in low resource settings. The state initiated programme would be more effective in achieving its objectives, through support from the Calmed programme. Sustainability would be assured through simulation training , mentoring and return visits as demonstrated by the successful programes in Sikkim and Gujarat. He visited the SCB Medical College, the Government Training Centre and a Skills Laboratory at the Nursing Training Centre (all in Bhubaneshwar), to see the feasibility of presenting the Calmed programme through a partnership model. Rotarians and the Rotary Foundation(TRF) could work with the Government of Odisha in adding further initiatives including simulation training and resources through the Calmed template, working in a manageable target area (covering a population of 1 to 2 million) selected by the Government for its need. 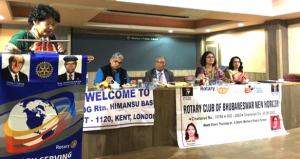 Dr Basu experienced great Rotary friendship and support from many members of the District 1120 and the host Districts and Rotary Clubs in India whom he visited, and wishes to thank them for their hospitality. See attached ‘Report on Calmed Visits 2017’ (under ‘Papers & Resources)) the full report on these activities.